rigors of the depression. I had never heard of that make of car, have you? to me,"Hope we don't hold you up on the highway." They may have the gadgets now but not the endurance. What a fine car. Greetings! And fine greetings to you also. there is a Franklin club too. Wow, what a fun trip those guys have planned. They sure will get a lot of attention. I did stop by your last post but it was all ready gone. Hope you are in a happier frame of mind now. they were having a blast. Sometimes you simply need to write something to get it out of your system, Manzi. The Franklin and the gents came by to help you smile your way out of your funk. Hugs to you. Never heard of them but I like it. expensive for my relatives. They had to stick with Fords. The look of old cars is very appealing. I agree. They had Real Class! Beautiful old car and I've never heard of Franklins either. 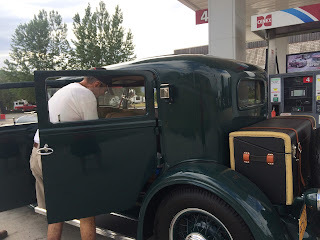 I wish I had taken a picture of all of the car, but by the time I got there, the old guys were loading the car and all the doors were open. I was impressed by the good looking leather trunk that sat on the luggage rack. That car looks like a beauty. It's wonderful that the car is still in such a good condition. Don't worry, the depression monster grabs hold of me all the time. Wishing you the best. What you live through when you're young, it's hard to forget. Every now and then, car enthusiasts host car rallies and shows. Cars are spiffed and shiny. A look in the past is what we all have when we attend these. I enjoy looking at the vintage cars but I also get a kick out of watching how proud the owners of these become. It's like their baby and they attack every particle of dust with a soft cloth. It's a beaut. And nope, never heard of it until now! You're a beaut too. Did you move to Florida? I lived there (Melbourne) 25 years and it never did feel like home. I always missed the obvious seasons because I know there are some changes with each season in Florida but I like wool. Ha. I did miss my friends after I left. Love old cars! They always have curious designs! At least the old cars don't crumble in an accident like the new cars do. I'd feel safer in an old one but they never had seat belts either. umm I wonder if they have to add seat belts to the restored vintage cars..... because it's now the law????? Now the law says parents HAVE to buy these expensive car seats. If they wouldn't make the cars paper thin, there would be no need for seat belts and kids car seats. And we would have to be careful about wearing long scarves in a touring car or it would get caught on the wheel and strangle us, like what happened to Isadore Duncan. I used to know the make of car.... a Buggati or something like that. I so glad you appreciate the vintage cars too. Real class. I also enjoy seeing old antique cars. One Two, life's a zoo. Yeah, those old gents were kinda cute. LOL "Go'n my way?" Can't say I've ever heard of that car in particular, but I love the look of it all the same.